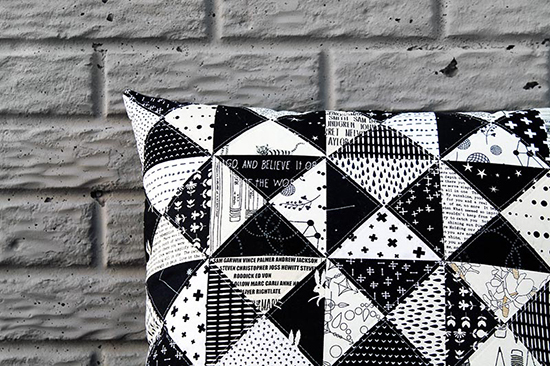 This week on the Sizzix blog I share a photo heavy, step by step tutorial on how I made this pillow using one of their dies. I even talked about why, and how, I chose all the fabrics. A friend of mine celebrated her birthday a couple months ago and I really wanted to make her something neat. I wanted it to be a bit Halloween and a bit everyday casual. I had just bought the smaller Accuquilt Drunkards Path Die and I was itching to try it. I had never pieced a curved seam, so I had no idea if it would actually come out or not. Well, as you can see, it came out beautifully! So much so, I have been obsessed with sewing curves ever since. (Check back tomorrow and I’ll show you another curved piecing project). The top is all fabric I had on hand. I love just picking from my Stash for projects like this. It gives it a more homey, scrappy feel. Also, as you can see, I have a thing for buying black and gray fabric, so it was neat seeing them all next to each other. I quilted the top in the way I normally do, in a 45 degree angle. However this time I only did the corners and let the lines overlap. So there’s lines and squares. To stabilize the middle I also quilted around the middle circle and stitched in the ditch of the middle seams. The back is Essex Yarn Dyed Linen in Black and is quilted with quick wavy lines. I added a (mostly) invisible zipper as the closure. I’m still getting the hang of zippers. I also stepped outside my comfort zone and bound the edges instead of having inside seams. I think this may be one of my new favorite ways to finish a pillow! Also, its great for gifts because the recipient can take out the pillow form and just be left with a mini quilt to hang on the wall or something. Now here’s where I will sound like the biggest jerk. I was planning on giving it to my friend in person soon after her birthday, but then I got super sick (pneumonia) and have been playing catch up since. She should be receiving the pillow in the mail TOMORROW! (oooh, now my friends reading this have to figure out which of them is receiving this pillow!! hahaha. I have a few gifts that just got mailed out, so really it could be any one of you.) I really hope she likes it. I seriously can not wait until after the holidays, when I have more free time to mess around with this die. There are so many possibilities for these little quarter circles, and I feel like I’m just getting started. 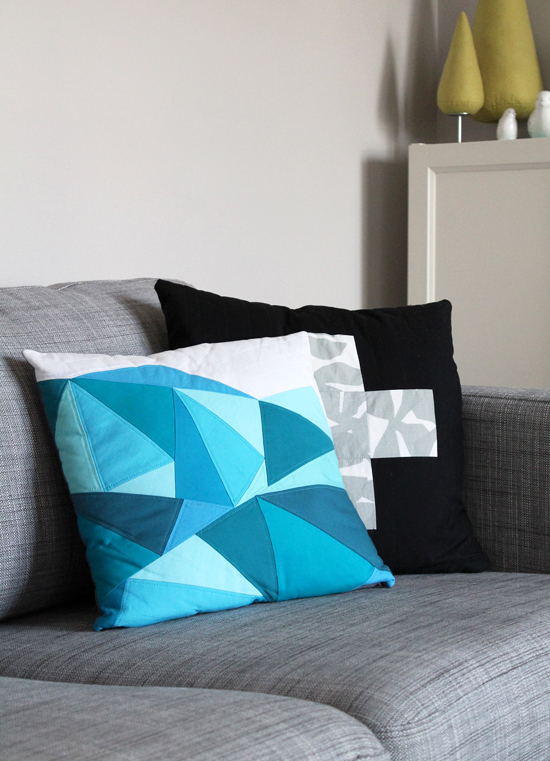 I have added another one of my geometric paper piecing patterns to the shop. 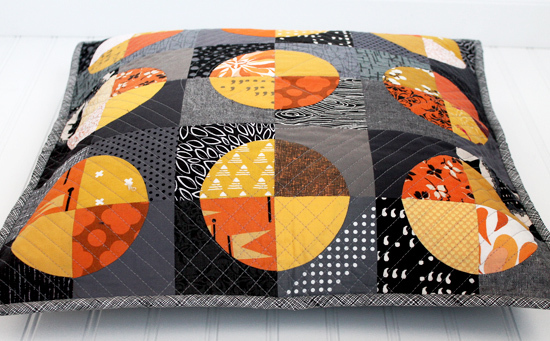 This time it’s for an 18″ square pillow that sorta resembles the mountains outside my house. Not too tall, kinda rolling hills, but loads of layers. If you decide to try the pattern out, I’d love to see photos!! Last week was a complete bust when it came to sewing. I started having horrible stomach pains early in the week and was pretty much stuck on the couch until late into the weekend. I’m feeling a bit better this week, but I’m still not 100% myself. Today I had enough strength to whip up a potholder (which I’ll share tomorrow, along with a link to a pattern) and get the two pillow tops shown above ready to quilt. I would have completely finished them if it weren’t for the fact that I ran out of dark gray thread, and would love some matching teal thread for the geometric one. So these won’t be finished until I make a trip out for supplies, but I still wanted to share them in their half finished state!! I can’t wait until I can cuddle with them on the couch! !